Imagine crossing the finish line of your next race; running down the final stretch with the crowd cheering as you throw your arms up in celebration. You’ve just achieved victory. Maybe it’s over the people in your age group. Maybe it’s over your previous best. Or maybe it’s over the old version of yourself, the one that was held back by a lack of belief more than anything else. In all cases, when you cross that finish line you feel that deep satisfaction that you’ve taken another huge leap closer to your potential. I started coaching to help you achieve that feeling, to help you challenge what's possible and inspire those around you to do the same. By using a detailed approach that zooms in on the process and zooms out on the big picture, my goal is to give you the guidance and the tools to make the most out of your training and perform your best. By implementing these training methods and strategies, I was fortunate enough to qualify for and compete in the 70.3 World Championships 2018 in South Africa. I look forward to seeing how far sport can take you! 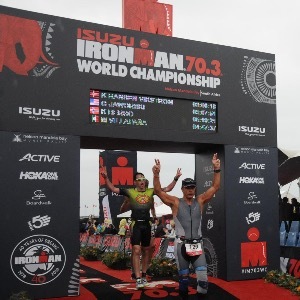 Griffin Jaworski is an IRONMAN Certified coach and a RYT 200 yoga teacher. Success. Coach Griffin Jaworski has been notified of your message. Intermediate Half Marathon | 13 Weeks to 13.1 | Goal Sub 2:00 or faster! Advanced 70.3 | 24 Weeks | Reusable | Dream big! IRONMAN 70.3 Boulder | 18 Weeks | Crush it in Colorado! Intermediate 70.3 | 18 Weeks | Reusable | Go for your goals! Intermediate 70.3 | 24 Weeks | Reusable | Reach the next level! Novice or First 70.3 | 24 Week | Reusable | Challenge what's possible! Advanced 140.6 | 24 Weeks | Reusable | Chase your dreams! Advanced 140.6 | 30 Weeks | Reusable | Test your limits! Intermediate 140.6 | 24 Weeks | Reusable | Reach the next level! Ironman Chattanooga 140.6 | The Road to Tennessee | 24 Week Plan | Chase your dreams! Ironman Florida 140.6 | 24 Week Plan | Push It In Panama City! Ironman Maryland 140.6 | 24 Week Plan | Crush It In Cambridge! Ironman Wisconsin 140.6 | The Road To Madison | Heart Rate | Perform your best! Ironman Wisconsin 140.6 | The Road To Madison | Perform your best! Novice or First 140.6 Training Plan | 24 Weeks | Reusable | Challenge what's possible! Wisconsin 140.6 | 24 Weeks | Make The Most Out Of Madison!